This recipe is 70 years old. And it comes from a friend of a friend, specifically, my friend Donna’s friend Marion who is 85 and has been making fudge since she was 15 years old. Donna brought a batch over one day, and I thought, “fudge, I don’t really care for it”. Little did I know it was the best fudge ever made on earth. 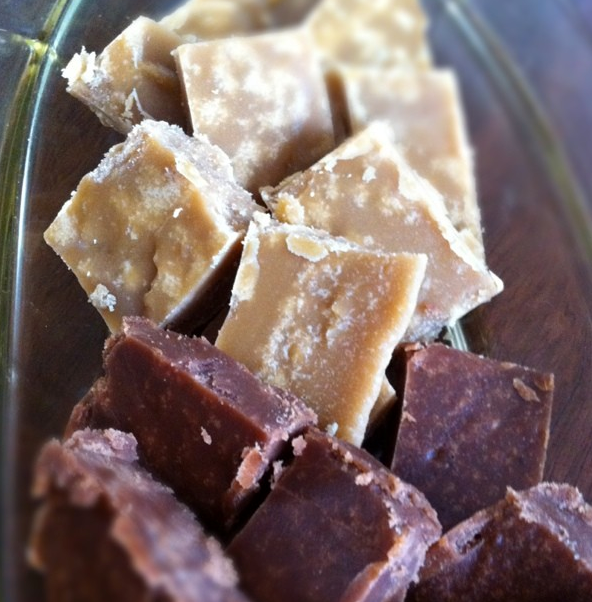 I finally (after several tupperware gifts of fudge) asked for the recipe. Donna brought me a photocopy of Marion’s handwritten instructions with the caveat, “many people have asked, no one has succeeded in making it”. As I went through the recipe the first time I realized why people were having so much trouble. It was written in a “dash of this, a dollop of that” kind of way that a WW II Codebreaker would have a hard time cracking. After many gruelling fudge-making trials Donna and I nailed it. 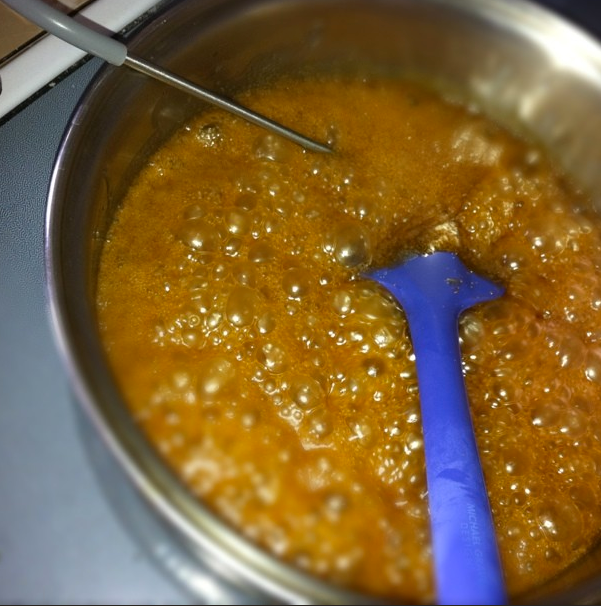 Before STEP 1: Marion says the whole fudge making process takes about 12 minutes. She will not answer the phone or be otherwise distracted during this critical time and recommends the same to other fudge-makers. I timed it–she’s pretty dead on. Please put iPhone on vibrate. This is the chocolate fudge version. 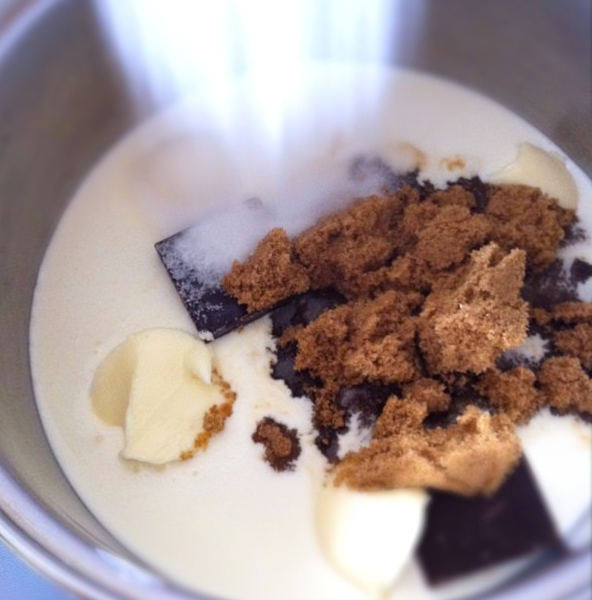 Brown Sugar, white sugar, semi-sweet chocolate, cream and Becel margarine. The first time we tried this I carefully measured the Becel margarine (I contemplated using butter but do I really want to mess with a 70-year-old recipe?) using my measuring spoons. Marion’s recipe said “4 tbsp.” The fudge turned out OK, but not nearly as creamy as it should be. I asked Donna to investigate. She came back and told me that the spoon Marion uses as a “tablespoon” is huge. I pulled out a soup spoon, “like this?” I asked. “Bigger” Donna said. I pulled out a serving spoon, and yep, hit the nail on the head. 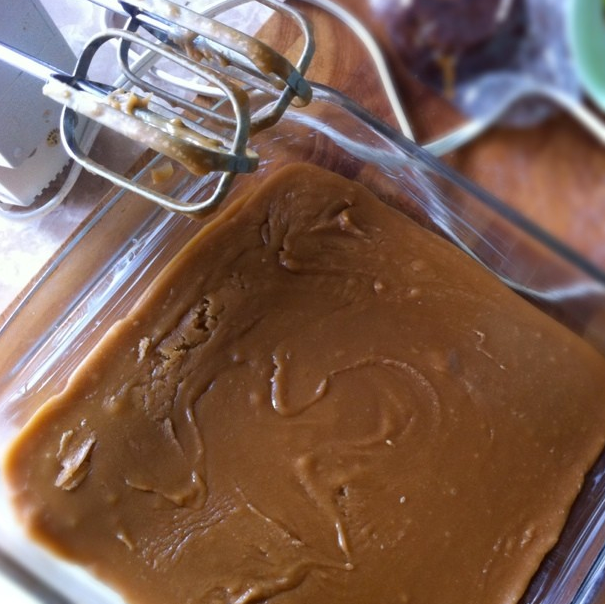 So for the vanilla fudge I use 6 tbsp of Becel margarine and it works like a charm. (4 tbsp seems OK for the chocolate as I think the chocolate adds creaminess). You now bring all the ingredients to a boil in a medium-sized, heavy bottom pan. You can stir them together as they melt. You are waiting to heat the liquid to soft ball stage (235-245 F). Waiting to reach soft ball stage. Marion uses the eyeball technique to pinpoint “softball.” You pull the mixture off the stove every once in a while and drop a globule into very cold water. You then roll the droplet between your fingers in the water to form a soft ball (which then flattens on your hand when removed from the water.) It takes some practise to grasp what you’re looking for. I nixed that technique. If you’re not a pastry chef or a frequent baker I predict this will be the end of your fudge making. Instead I grabbed the digital thermometer (a candy thermometer available at the grocery store is also fine) and pulled the mixture off the stove at 240 F.
This was the most mysterious part of Marion’s process. The instructions read, “Pour mixture into your Mixmaster and beat on speed 11 for about 1 minute. Carefully watching.” Watching for what? Donna did not know either. 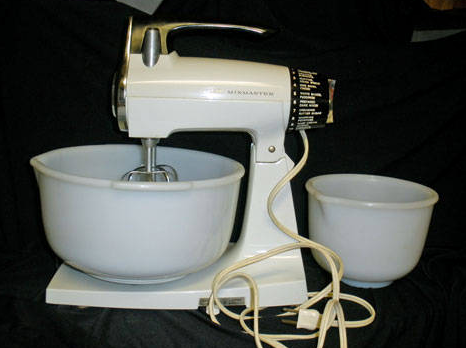 Secondly, I am pretty sure the Mixmaster only exists in Marion’s kitchen and the Julia Child kitchen at the Smithsonian (it has 11 speeds!). Instead of the Mixmaster I pulled out my electric beater and used that. Considering it is a hand-me down from my mom and its highest speed is as fast as the “low” speed on a new model, I figured it would work. I poured in the hot fudge with a tsp vanilla and started beating. And after about a minute I saw the splattered edges of the bowl start to crystallize–like the texture of fudge. Which I believe is what you’re “carefully watching”for. 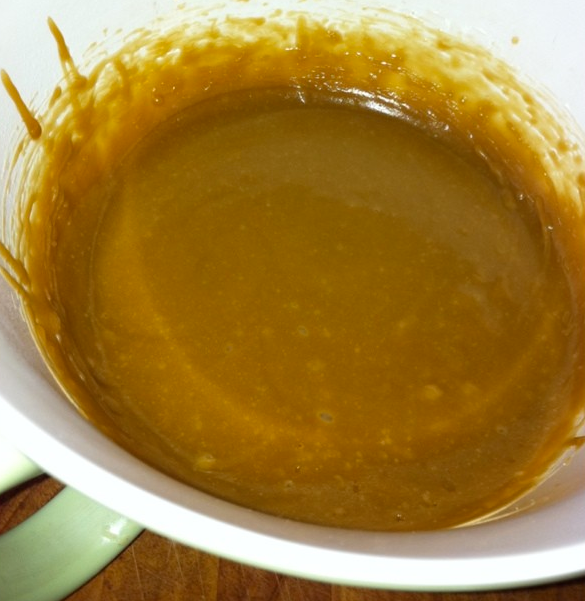 So at that point I poured the thickening mixture into a 9″ X 9” greased dish. Allow to cool while you lick the bowl. Slice and eat. You win! Your life is now the best it will ever be. 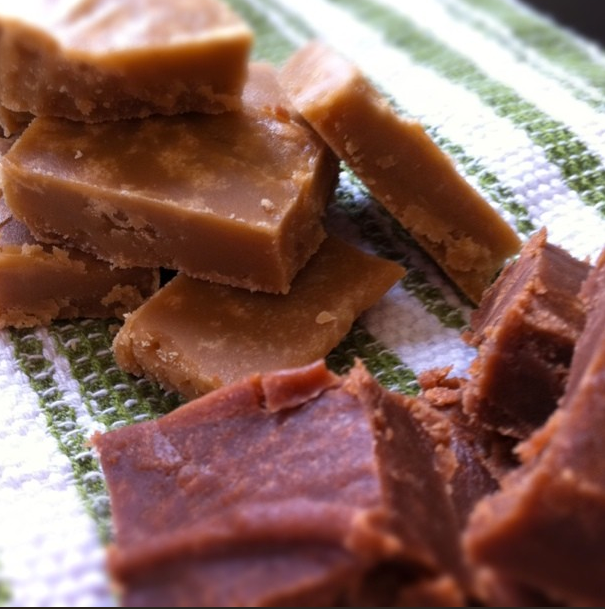 Marion’s Fudge Recipe (Adapted for lesser mortals). *Love* the blog, Ms. Riedl! Wowzers! This looks so amazing and I love the part about “Carefully watching.” I think I need to make this recipe and look like a rock star at my next BBQ invite- fudge is such a great hostess gift and sharing treat. Thank you for this, I’m so pumped! It is really nice Johanne. Let me know if it works out for you!